Dry Stone Walling. Built and Repaired. Stroud, Gloucestershire and the Cotswolds. 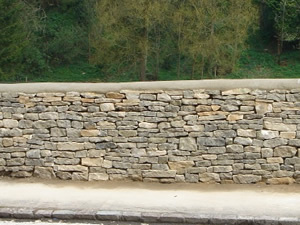 I build and repair dry stone walls to the highest of standards, using the most suitable and best quality materials. I have undertaken work for individuals, large construction companies, churches and have even been commissioned to build walls for film sets. I am passionate about my work and take pride in every job I take on, no matter how large or small. It was pointed out to me a few months ago that I hadn’t updated my blog in quite a while. It’s one of those jobs that I often think “I must do that“, a bit like my tax return but a lot less painful. What a year it has been. My work has been a lot more varied than in previous years, both in the nature of the work and the geographic area. 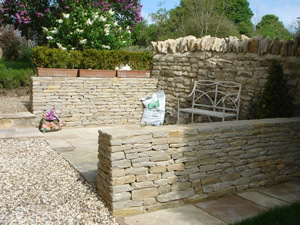 I have found on several occasions that the walling work I specialise in has been part of a larger overall landscaping or building scheme. This has meant I have been able to diversify in to paving, lime work, water features and more general building work. Being quite used to working within sight of my home, it was something of a surprise this year to find myself working as far afield as Somerset, Worcestershire, Oxfordshire and the West Midlands. Needless to say, having covered over thirty five thousand miles, I’ve noticed the price of diesel. So if somebody gets on your bus with a ton of stone and a hammer, trying to save some money, please say hello. Randwick, just outside Stroud in Gloucestershire– Iain Humphryson’s home village – was in celebration mood on Sunday 22nd August 2010 for the dedication of a 54 metre long dry stone wall, which marks the boundary between the churchyard and a steep footpath leading down to the School playground. The original wall built more than 100 years ago had fallen into serious disrepair. Iain reclaimed some of the original stone but needed to source a further 50 tons (about 50 sq metres). The mix of local Cotswold stone with greyer Purbeck has made the wall tone in remarkably well with the other churchyard walling. (The Purbeck stone which came from a film set Iain had constructed merits a story in its own right). This superb professional work reflects not only Iain’s skill but also his dedication: just to carry each stone up or down the 1 in 4 slope, without vehicular access, has involved both strength and perseverance. Local people have become increasingly proud and excited by this outstanding example of a traditional Cotswold craft right in the heart of the Village. We were now falling behind our schedule due to the delay on the motorway, our incident on Scafell Pike and our attempts to dry our kit. To stand any chance of completing the challenge within the 24 hours it was essential that we were starting our final climb by 3 am at the very latest. This would mean we would still have to climb the mountain and get back down in 5 hours rather than the recommended 9 hours. Old road had done his bit in getting us to Ben Nevis by 2.45 am, which gave us a few minutes to sort out our gear and put head torches on ready to start our final climb in the dark. We were three quarters of the way up the mountain by dawn. Fatigue was setting in and most of us were starting to feel nausea. We continued to climb in the mist and drizzle that had accompanied us north of the border. We followed the trail as it zigzagged up the mountain. There was noticeably less banter and chat than the previous two mountains. Even Jonnerz, who is never normally short of something to say, could only manage half a dozen wise cracks on the entire 10 mile trek. The final mile of the trek up the mountain seemed endless. Just as we thought we could see the summit through the mist, another chunk of mountain would make itself visible. The weather conditions deteriorated rapidly in the final few hundred yards. A small patch of snow served as a warning as to how bitterly cold it could be. We didn’t dwell at the summit for long. The view was totally obscured by the fog and the icy wind and driving rain were enough encouragement for us to do an about turn and head back down as quickly as possible. With only1 hour 45 minutes left, it was clear we would have to pick up the pace and bear the added pain of every joint jarring step. We kept close tabs on the remaining time, still unsure if we would complete our challenge in time. Having broken in to two groups earlier, Mark, Trevor and myself made it back to the start with 5 minutes to spare. Andy, Paul and Gary followed us a couple of minutes later. For a few minutes we all forgot about the aches, pains and exhaustion, just basking in the glory of our success. A final 8 hour slog south lay ahead. Old Road had somewhere in mind he wanted to take us for a bit of breakfast and I must say, The Green Wellie at Tyndrum didn’t disappoint. With the sun finally shining at last it seemed the ideal opportunity to get a group photo to remember the experience by..
On behalf of all the guys I’d like to say a massive thank you for all the support and encouragement we received. Also to all those who put their hands in their pockets to help us raise around £1000 for two very worthwhile causes, Thanks so much. We set out at 8am from the foot of Snowdon, following the Pyg track up to the summit. Within about a quarter of an hour the rain started. Rain that would soon become the 8th member of our team. Following us like a lost puppy everywhere we went. By the time we reached the summit, we no longer looked like an advert for Berghaus, instead resembling escaping victims of some kind of natural disaster. We were al amazed at the view from up there, being able to see for literally……. yards! The annoying lost puppy followed us back down the mountain through the mist. 2 hours and 50 minutes after setting off, we were back at the hostel where we were able to dry ourselves and our kit, have a wash and change into dry clothes ready for the next leg of our trip. The drive to Scafell Pike some 217 miles away gave some the opportunity to get a bit of sleep. Even those who are normally unable to sleep in moving vehicles would have had no problem as we sat in stationary traffic on the M6 for a good length of time. Instead this just sparked a debate about road works and the lack of work being done on them. We finally arrived at Scaffel Pike. Wet, gloomy and miserable looking. The weather that is, not Paul! Old road had managed to claw back some of the time we lost while sitting motionless on the M6. His lead foot coming in to its own. , a pair of boxers, a fleece jacket and a pair of trainers was all I could muster. Thankfully the others were too preoccupied to obtain any photographic evidence of the embarrassing kind. Shortly after 10pm we were on our way to Ben Nevis with all our sodden kit. At 2.45 on Friday 23rd July, the group attempting the three peaks 24 hour challenge met up. Myself (Iain Humphryson), Andy Morris, Paul Fowles,Gary Smith, Mark Johnson and our driver John Lusty loaded all our kit (much of it still with the price tags attached) in to the mini bus ready to head off to our first destination, Snowdon. As always somebody has to be the last to arrive, fashionably late, Trevor Hudson completed the party. We arrived at Snowdon at 7.30, checked in to the hostel and had an evening meal. Before heading to bed we had a few drinks in the bar. As always the uniquely funny Mark (Jonnerz) Johnson made sure the banter started and we had a good laugh and joke. Any hopes of getting a good nights sleep were quickly shattered by the man in our dorm who became known as Mr Torch head, who felt the need to illuminate the room then shine his torch in the faces of each of his room mates like some kind of interrogator. As if this wasn’t enough, the heat of the room, snoring and what can only be described as animal like animal like noises coming from the bunk of one of the other strangers in the room, would certainly do the trick. John (Old Road) Lusty’s decision to stay in much grander accommodation in nearby Llanberris now looked like a pretty shrewd move. With a combined total of about four hours sleep between the six of us, we had breakfast then headed across the road to the start point for the first of our mountain climbs. Before my recent leg injury, I committed, with a few friends and fellow members of Randwick football club to attempt the Three peaks challenge. For those who don’t know, this involves climbing the three highest mountains in Britain within 24 hours. The event is scheduled for 24th July starting with an early morning climb of Snowdon before a five hour journey to Scafell Pike. After scaling the highest mountain in England we will hit the road again, travelling some 270 miles north to Ben Nevis for our third climb of the day. With any luck John (my father in law and our driver) will be waiting to pick us up (possibly literally), and have the kettle on. As well as being a bit of an adventure, we hope to raise some money for The Door Youth Project which is a Stroud based youth charity and another good cause - Uplands care home. Already the sponsorship tally is climbing rapidly. Knowing how much money will be raised will certainly be a great motivation and make all the aches, pains, blisters and sleep depravation worthwhile. If you would like to show your support by making a donation please visit www.virginmoneygiving.com/IainHumphryson I will update this page after the big day. In March last year I was approached by a film company to build some dry stone walls on the set of a film. The film, I later found out, was Ridley Scott’s Robin Hood staring Russell Crowe and Cate Blanchett. In total I built son fifty four metres of walling on set in the Surrey countryside. While working there I got a glimpse in to another world, far removed from reality. It was a fantastic job to undertake but as I was there well before filming started, sadly I didn’t get to see Russell Crowe or Cate Blanchett although Ridley Scott did pay a visit while I was there. Needless to say, when the film was released last month, I made sure I was there for the first screening at my local cinema. I was more than a little curious to see how my work looked on the big screen. Its not everyday your work can be seen in a blockbuster film. By the end of the two and half hour plus film, I had a little smile to myself. My work, or should I say, a small part of it appeared on screen for a split second, half a dozen times. As for the rest, it was left on the cutting room floor. I came away thinking to myself I have probably completed the most expensive few seconds of background scenery in cinema history. All of a sudden I could understand and believe reports of the film having a $200 million budget. Attention to detail doesn’t come cheap. Things have been a little on the quiet side with work since my last posting here. I have managed to tear my calf muscle while working on a wall at my local village church. It happened last Tuesday morning while I was using a wheel barrow on a steep hill. A visit to Stroud A&E followed by a further appointment with a specialist confirmed what I immediately suspected. The only blessing I suppose is that I didn’t rupture my Achilles tendon, which was the other possible diagnosis. Being self employed I shall be returning to work as quickly as possible. Maybe my recovery would be a little more protracted had it happened at the start of the world cup. I think my last entry here may have tempted fate by talking about health and safety and visits to casualty. Don’t be too surprised then if my next entry makes some kind of reference to the national lottery. Anybody who does any kind of manual work has to give a little more consideration than most to health and safety. Accidents happen from time to time and like anybody, I prefer not to become a regular visitor to casualty. My dilemma goes back to last summer. Despite the majority of it being far from the barbecue summer that was promised, there were a few odd weeks of pleasant, sunny weather. Giving me the opportunity to put my shorts on and inflict the sight of my legs on any poor, innocent passer-by. It didn’t take too many of these days for me to take on a darker hue. That was with the exception of my feet! My rapidly darkening legs simply highlighted the milky complexion of my feet. My wife couldn’t resist the opportunity to have a good laugh at my expense. Now with summer approaching once again, I am left to ponder the choice of protecting my feet and looking ridiculous, or taking on a third world approach to health and safety by wearing flipflops. Welcome to my blog. It has taken me quite some time to getting around to writing this, the first entry. In fact, being completely honest, this only came about as a way of easing my guilt. As the saying goes - Make hay while the sun shines. It had been my intention to capitalise on the recent spell of good weather we have been blessed with. For the most part I have started the day a little earlier and finished a bit later. Today however, while the sun was shining, I had the overwhelming urge to stop at 4 o clock and go home to sit in the garden with a nice cold beer. So, here I am. Beer in hand, trying to think of something interesting to write about. Maybe another beer will help!